Today's special guest is author Michellene Barrett and focuses on her novel, Englisha and David's Adventurous Vacation. Welcome, Michellene. Please tell us a little bit about yourself. 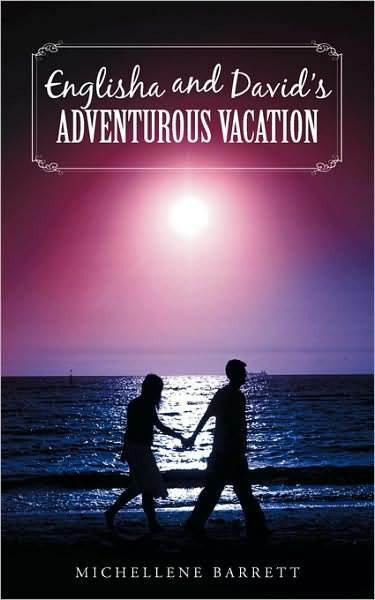 In my senior year of high school, I published my first juvenile fiction, Englisha and David's Adventurous Vacation. The story of Englisha and David is about two teens who begin dating and embark on an adventurous vacation in Los Angeles. They must learn the value of love, forgiveness and living life to the fullest. In the fourth grade, I began writing stories about the adventures of Englisha and David. During lunch time, my classmates would listen as I shared my stories. They would say, "Michellene, you need to be a published author. Your stories are so funny." I soon began my quest to becoming a published author and eight years later, it became a reality. I graduated from Columbia University Teachers College with a master's degree in Literacy. I also obtained my bachelor's degree in Childhood Education from City College of New York. I am currently an elementary school teacher in New York City. I am currently working on my second book in the Englisha series which comes in the fall of 2015. The main characters Englisha and David are now seniors in high school and they have to navigate through a lot of drama. Their relationship is tested when David's secret comes out. It's a story about trusting again, forgiveness and love. I was inspired to write my second book because of all the fans of my first book Englisha and David's Adventurous Vacation. I always wanted to write the story of Englisha and David as a book series. But there was a time after writing my first book where I no longer felt like writing. I was in college and I felt disconnected from my target audience (preteens and teens). I didn't think as an adult that I could write stories that would appeal to teens. All that changed last summer when I worked at the Action Arts Summer Camp at Columbia University Teachers College. I began reading my first book Englisha and David's Adventurous Vacation to the campers and I was surprised by their reaction. It was like I was in elementary school all over again. All the campers from ages 6-13 gathered around and listened to my story. They enjoyed the book so much that they began to share ideas for a book 2. Right there, I was inspired to write book 2 and make it bigger and better than my first book. "Tomorrow is my sixteenth birthday!" Englisha Regents shouted to her best friend, Laurenthina, as they entered the school building. "Tomorrow is also the last day of school. Hooray!" Laurenthina chimed in as she swiped in her ID card through the security system. "Well, who are you going to invite to your party?" "Okay, let's see: you, Jasmine, Jasmina, and Clender," Englisha said. "Well, that's all I thought of so far." Laurenthina's eyes opened wide. "Are you telling me that you are not inviting any boys?" "I don't know, but you can tell your brother to come," Englisha said, trying to find a seat in the lunchroom so she could eat her breakfast. Laurenthina flipped her long, curly, light brown hair as she sat down. Laurenthina looked at Englisha as if she were crazy. "Oh, come on! My brother?" "Well, I could invite David, from my Spanish class," Englisha said, uncertain. Englisha had liked David since freshman year of high school, but he had a girlfriend. When I first began writing stories, I never saw myself as a writer. I was just writing for fun. I continued to write because my classmates were entertained. I began to think of myself as a writer once my audience began to grow. At my elementary school, I attended the after-school program where my peers would gather around and listen to my stories. They would say, "Michellene, your stories are good. You should get them published." The more I heard that, the more I gained confidence and believed that I should be a published author. I was in the fourth grade when I first wrote the story of Englisha and David's Adventurous Vacation. I would write my stories when we had creative writing time in class. I would also bring my writing journal to lunch and continue writing. I am currently an elementary school teacher so it is so hard to find time to write. Sometimes I write for about an hour on Sundays. I mostly write when I'm on the train or bus. Sometimes I get really impatient when writing. I would get so excited about a certain scene because I want to know what happens at the end. I have this urge to turn the page and read the end of the chapter but I can't because I'm writing it. Also my brain goes so much faster than my hands can write or type. So I have to remind myself to slow down, be patient and write the necessary details that leads up to the end of that chapter. As a child, I also wanted to be a teacher. When I developed a love for writing, I decided that I would do both. I would be a teacher and an author. If there was any extra time, I would be a singer/songwriter too. My goal is to use all my talents in a positive way. Look out for my second book which comes out fall 2015! It's my best writing! You will really enjoy it!